Mostly cereals. Barley, wheat and oats are fairly common in their rotation, with other grains slotted in, including flax, lentils, hemp, spelt and emer. Jed and Amber Franklin transitioned to growing organic grain already convinced that the advantages of this business model outweighed the risks. “I don’t know of any business with a surer certainty than agriculture,” Jed says. “Even if there’s a drought or a disaster,” as long as he succeeds in limiting input costs in his organic system, “I will have more return for my work going in,” he says. For example, for an organic crop yielding 15 bushels an acre, “it would take 45 bushels in conventionally farmed grain to pay for the inputs” to arrive at the same gross income, he says. Special care during transition to organic production methods is “where the danger is,” Jed says, mostly because of weeds. Jed wouldn’t recommend implementing the weed-suppression strategy he used to get his farm’s land switched over to organic production. Initially “I was a big fan of growing alfalfa for hay, then transitioning land in,” he says. “But I’ve since realized that during all those years, I was selling phosphorus off my farm. While you only need 30 pounds of phosphorus to make a decent grain crop, alfalfa takes 250 pounds of P”; oftentimes, available phosphorus in surface soils is already quite limited. Jed’s rotation is mainly based on needs predicated by weed pressure, rather than a set schedule. “I really fight with wild oats, so I’m trying to avoid black fallow,” he says. Over the years, he’s tested different annual clovers and hairy vetch with the intention of keeping the ground covered and improving soil. Jed’s favorite cover crops for soil building and intercropping with plough-downs are sweet clovers and red clover; “red clover will do well in a wet year and sweet clover does well in dry year,” he says. 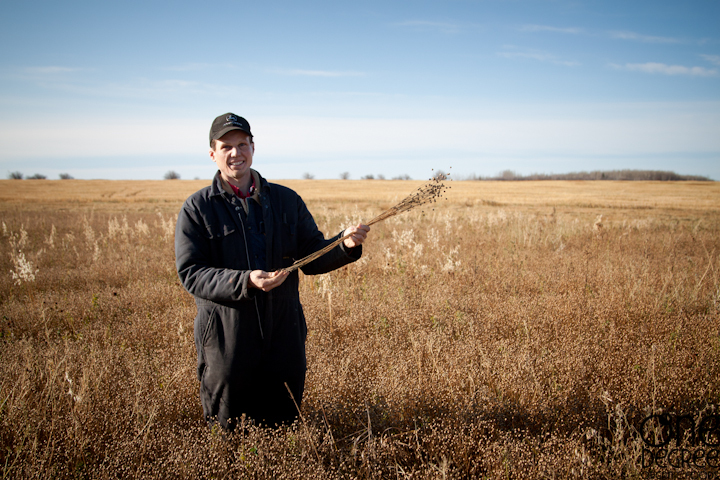 “There is nothing like seeing huge cover crop, usually yellow blossom sweet clover, that’s taller than you.” He has to pass over it with a heavy disk, then a medium disk to cut it down and chop it up; the mat left behind is three inches thick and very effective at preventing weed germination while it decomposes. “This year, we had a bunch of test strips in, an experiment with tillage radish,” he says. Tillage radish winter kills and has a suppressive effect on early spring weeds; Jed is also interested in tillage radish’s potential to bring phosphorus up from the subsoil through its long tap root, and the fact that it is relatively high in calcium. Newly transitioning farmers should consider all the characteristics of any crop they think they might want to grow, from planting through to harvest and cleaning. For example, farmers some might be tempted into growing organic flax because of its value as a niche crop, but flax is “a terrible competitor” with weeds and can lead to long-lasting weed problems; flax is also difficult to clean to meet product specifications. It’s important to be aware that “crops worth a lot of money often have very picky buyers. You may be growing a crop, and you think everything looks good, but a buyer might come back saying ‘we can’t take this because it’s only 99.93% clean.” New organic farmers can avoid unnecessary stress if they remember that “niche demands come with niche products,” Jed says. Figuring out where to market crops gets easier over time, Jed says; networking can be extremely helpful in terms of organizing grain transportation, trucking and rail access. Even though organics is relatively small scale, efficiencies can still be found. For example, having found that selling grain by the pallet was “a lot of nuisance relative to using an augur and a train,” Jed purchased a rail loading facility. “This kind of investing in agriculture is necessary, and helps us to be reliable sellers,” he says.